Rudd Company, Inc. can trace its roots to 1912 when Donald M. Cummings, great-uncle of the Company’s current Chairman, first started producing paint in the Seattle area. As the Depression was ending and World War II became reality, Mr. Cummings merged his Petro Paint Company with a competitor, Harold M. Rudd and his Rudd Paint and Varnish Company. Mr. Cummings’ nephew, Alan M. Park, Sr. acquired a majority stock interest in the corporation and took over as President and CEO in the mid-1950’s. During the next decade, the company pioneered chlorinated rubber, epoxy and gel coat finish products and held a strong Pacific Northwest presence in wood preservatives and marine coatings. In late 1950’s Mr. Park recognized the business potential of the aerosol industry, during its infancy, and installed the Company’s first packaging line. Alan M. Park, Jr. joined the Company full time in 1969 and began assembling a team of young professionals who by the late 1970’s had reinvented the Company’s market niche with a focus on wood finishes and aerosol packaging. 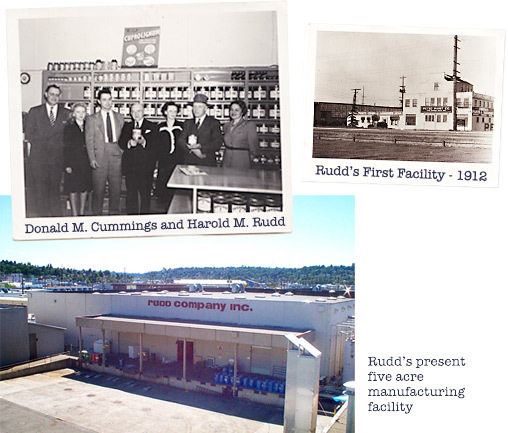 In 1980 the corporate name was shortened to Rudd Company, Inc.
Rudd Company relocated all of their operations in1995 to their present five acre manufacturing facility in the Ballard neighborhood of Seattle, Washington. The decorative concrete and specialty market was entered by Rudd in 2000 with the acquisition of an artisan finish developed by Seattle craftsman and professional plasterer, Don Miles. This unique cement based product became the foundation for the SkimStone and Milestone brands. In October 2008, Rudd Company acquired Glitsa American, Inc. a key supplier to the professional floor finisher and the original source for Swedish Floor Finish. The relationship between Rudd and Glitsa had its start nearly six decades earlier when Rudd secured the license to manufacture Glitsa Swedish finish in the U.S. and Glitsa American secured the license to sell and market Glitsa Swedish finish in the U.S.
Today’s key management positions are held by individuals whose careers have centered around the paint and coatings industry. They benefit the Company with an established reputation for providing high quality products and services designed to meet the varied demands of our customers, both today and in the future.